Although Chelsea are keen to stress that they have not yet decided whether they would leave Stamford Bridge, chairman Bruce Buck said his hopes of renovating the stadium were "doubtful" after several years spent looking into its feasibility. The club are looking at other sites in Battersea and Earls Court and have promised the CPO members that if they agree to sell their shares, the club will not move more than three miles away from their current home before 2020. CPO members will vote on October 27 whether they intend to sell their shares to club owner Roman Abramovich, but there is mounting concern about any potential move from Stamford Bridge. One fan commented on Twitter: "I think if £CPO reject the proposal, surely that's like spitting in Roman's face after (all) he's done for the club." 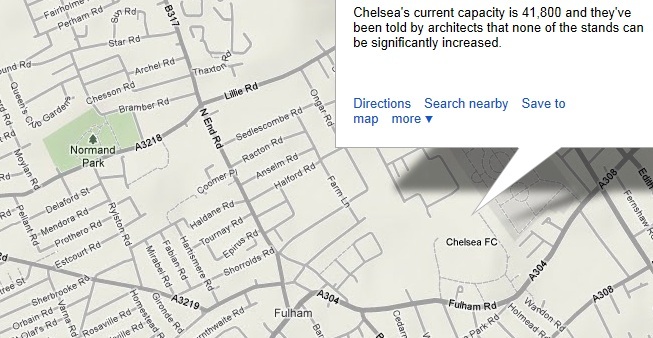 Chelsea insist it is entirely up to the CPO members to decide whether they want to sell their shares. Buck revealed on Monday that if the CPO do decide to sell, their shareholders will receive priority for season tickets and will have their names written on a 'walk of honour' at any new stadium. Surely a no-brainer? 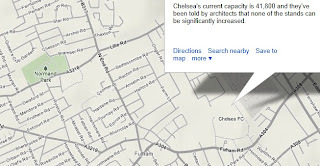 Those jolly nice chaps at TalkSport have come up with an interactive map showing possible locations of a new stadium for Chelsea. View it for yourself here.